Adventure Web Productions Launches New Site: C.D. 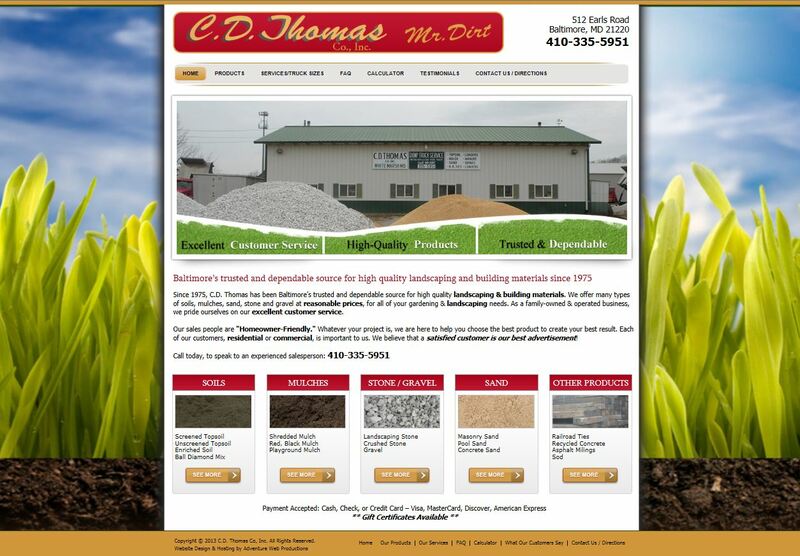 Thomas Co, Inc.
A family owned and operated business, C.D. Thomas provides high quality materials for building and landscaping. Products include soils, mulches, sand, stone and gravel. You can find a yardage calculator on the C.D. Thomas website to help you determine how much material you need. Small, medium, and large trucks are available for same day or next day delivery. Don’t be afraid to ask questions: C.D. Thomas prides itself on excellent customer service, so get to know the team! You can also find FAQ’s on the website at http://www.cdthomasco.com. For more information about web development, contact Adventure Web Productions now!